The landmark alliance between Qantas and Emirates has received final approval from Australia’s competition watchdog five days before the tie-up is due to take effect. In a ruling released today, the Australian Competition and Consumer Commission (ACCC) said it was satisfied the alliance would result in “material, but not substantial” benefits to consumers. However, as a condition of approval the ACCC ordered the two carriers to maintain at least their current level of four overlapping trans-Tasman routes, addressing a key concerns over the tie-up. 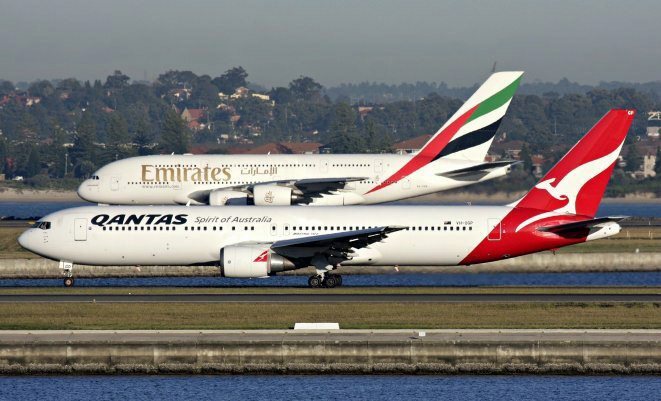 Together, Qantas and Emirates account for 65 per cent of passenger capacity between Australia and New Zealand. The ACCC also stopped short of granting the ten-year approval Qantas and Emirates had sought, instead giving five-year approval and requiring the airline’s to apply for reauthorisation in 2018. The watchdog said the alliance would likely hurt competition in regions where Qantas and Emirates currently operate competing services. But it ruled that those detriments would be minimal because of competitive constraints, and said the public benefits outweighed the drawbacks. “The ACCC considers that the alliance is likely to result in public benefits through enhanced products and service offerings by the airlines, and improved operating efficiency,” ACCC chairman Rod Sims said. Qantas CEO Alan Joyce welcomed the decision and said the airlines were ready to commence joint services on March 31. The approval allows the two carriers to coordinate their passenger and cargo transport operations and related service and to jointly procure goods and services such as aviation fuel. The airlines did not seek authorisation for the supply of catering or aircraft cleaning services. Ok, everything is approved.. How long do we wait until we determine if the tie up is indeed as wizz bang spectaular as we have been told it will be? And I bet the Virgin Tiger deal will get the knock back. ACCC always inconistent. Lets all remember who created jetstar! Probably a few quarters to a year to see the full financial benefits for Qantas flow on through properly. That said the network and connectivity benefits will be fully available to see and utilise from the 31st March. A number of analysts are predicting that Qantas International may benefit so much from this partnership that it could be hauled back to profitability before the target set by management. Interesting times ahead!!! So thats it for any Qantas passengers wishing to “go places” on a Qantas plane ex Perth overseas. Oh wow Singapore once a day. Gee the ever shrinking Qantas overseas network. I really have run out words to speak about Qantas anymore. It’s one of those interesting paradoxes. If enough people flew with Qantas overseas from Perth (i.e. to Hong Kong before the cull) they would maintain or consider increasing service. But so many choose to fly on rival airlines thereby making current Qantas services unviable leading to a reduction in services thereby leading to complaints that Qantas are serving the passengers there. Maybe if Qantas wasn’t so expensive people would. Perhaps if their old school pilots and cabin crew had a look at what the new ones were earning and weren’t so stubborn then maybe they would still be flying. INDEED! That is the core issue! It is, unfortunately for this unionist, a case where the power of the unions is far too strong. Last two comments here from Sam and Tom = a great, pithy summary of the problem. Tom, for someone clearly working for the Qantas PR machine you do a pretty poor job at being discreet about it. Let’s see, so far you’ve covered: Emirates deal good for Qantas, QF staff overpaid, hmmmm what next. Wait a minute, where have I heard all this before? Hmmmm. AA, how about some genuine posts on here not PR rhetoric. How about a few less assumptions yeah?? FYI, I’m a currently unemployed student studying French abroad in France. The only connection I have with Qantas is that I am flying with them (and Emirates via the partnership) on my way home in a few weeks time so naturally I am interested in the particulars of the arrangement. An interest in Australian aviation also helps. I find your rude assumption that I work for the Qantas PR machine and that my posts are not ‘genuine’ highly offensive. How about next time you actually get some perspective and realise that outside of the ‘Qantas PR machine’ there might actually be some people who support the current Qantas strategy and are actually articulate enough to express their opinions instead of insulting people who don’t agree with yours. Agree with John Harrison – one QF flight a day to Singapore. Yippee. To ‘enjoy’ the QF-Emirates benefits we now have to fly Emirates ex Perth. Their 380 (ex Sydney/Mel) may have great business class product but not so their services ex Perth. Competitors Singapore, Cathay, Qatar all offer better.